If they copy you, you're doing something right. There's probably a better way of saying it though. 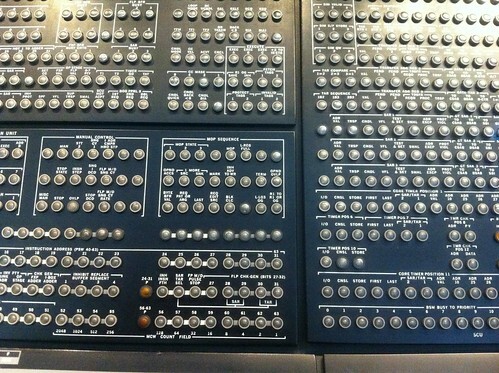 This is part of an IBM mainframe that I saw at the Science Museum in London. It's hard to imagine that anyone ever understood what they all meant. I think the reason there are so many lights is because there is so much to go wrong. The lights show when something's working, so no light means failure, or when something fails. These days the FLP BFR (flip buffer?) always does what it's supposed to, so we don't need to have a light for it. I remember when modems had a full set of lights: TX, RX, DCD, DTR and so on. I also remember using them to try and work out why connections weren't being made. As they became smaller and sleeker they had just a couple of lights to show activity. Then they disappeared altogether. We need lights for things we can't rely on. Once it's reliable the lights go away. Today I was re-reading the essay from Douglas Adams, "How to Stop Worrying and Learn to Love the Internet", written in 1999 (I wonder if that distinguished journalist still things the Internet is a fad). Quoting the computer scientist Bran Ferren he says, "Technology is stuff that doesn't work yet". Douglas illustrates this: "We no longer think of chairs as technology, we just think of them as chairs". So my corollary to this is technology needs lights. Chairs don't need lights. One of the attractive things with Salesforce is that you can add fields all over the place. However as you dig deeper you find limitations, such as the fact that you can't add custom fields to Notes, even though the idea has been around for years (good to see it's in "product review" though). In some ways it's like being back to the good old days of Lotus Notes, where you could create new fields really quickly, though fortunately there is a bit more rigour involved than Notes had when putting them in. If you use a managed package, aka "app" then fortunately you can add fields to their custom objects, which we've made good use of. You can't rename their fields, though here's a tip: use "translations" to override them. The "classic" interface is two generations behind the latest UI aka "Lightning". The previous generation is VisualForce and you can't change the layout of VisualForce pages, so already things are being locked down for the sake, presumably, of better functionality and preventing people really mucking things up. DemandTools has a good range of data manipulation tools and is free for non-profits. Jitterbit data loader has some powerful mapping tools for importing data. Purple Vision, who helped us implement Salesforce/Causeview, has unfortunately undergone voluntary liquidation. The BBC iPlayer radio app is going to stop working in January on iOS7. I understand the overhead in supporting multiple platforms, so I'm not going to complain about that. The iPlayer will still be available on the web though. I general listen to iPlayer radio while I'm washing up, which is around 6:30-7:30. I generally miss the start of the Radio 4 6:30 comedy slot, so I often listen to the previous working day's programme instead. In order to speed navigation to the previous day (or the one before that) I've made this page which will take you to the evening schedule for 1, 2, 3, or 7 days in the past. Enjoy.